The Godman of this century is Maharishi Mahesh Yogi who has exploited thousands of his disciples by offering to teach them levitation. 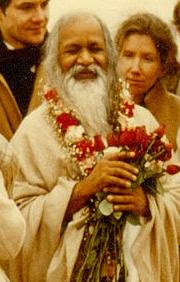 In 1978 he held the first levitation demonstration of his students at New Delhi. The Supreme Court judge Y.R. Krishna Iyer had written an article that he had himself wit­nessed levitation by the students of Mahesh Yogi at Switzerland. They were seated on 12" thick foam beds, and hopped up and down like frogs. According to Mahesh Yogi this was the first step in flying. Even after two decades of practising TM they have not gone beyond this hopping. As a guru teaching others the art of levitation, it should be possible for him to fly himself. So we asked him to fly from New Delhi to Old Delhi to prove that levitation is possible. He agreed to prove that levitation is possible if we brought Rs.I0000/-. We were ready at his door-step the next day with this amount. His reply then was that his yogic siddhi of levitation was not for demonstration. We wondered why a person who could fly when ever he willed it should need half a dozen helicopters to get from place to place, and why he conducted the hopping demonstrations. A yogi is seen sitting on a stool with his yoga-dand under one arm pit. When he goes into samadhi his assistant removes the stool and he is seen to be suspended in mid-air. Props: One three feet square and 6" high platform with a hole in the centre to hold the yoga-dand through it. A stool, a metal base to fit the bottom of the yogi with a rod upto his arm-pit, and a yoga dand. Method: The platform is in the centre with the yoga dand fixed in it. The yogi sits on a stool with his hand on the yoga dand. He goes into samadhi. The metal base is inside his kaffni with the rod on the right side under the dress up to the arm-pit and fixed to the centre of the yoga-dand. As soon as he goes into samadhi the stool is removed by his assistant and he is levitating. With the back metal base fixed to Yoga Dand, he is hanging on the Yoga Dand. Effect: Levitation using Hockey Sticks! This is the best levitation trick I have ever seen without any props near the Red Fort in New Delhi. A bed is on the ground. A person comes and lies on it. He is covered with a very big bed sheet stitched like a mosquito net which has a hole for his head to see. Then he levitates slowly one foot up, then two and later to his height inside the bed sheet. Props: Two hocky sticks hidden in his pyjama, one big bed sheet stitched like a double mosquito net with thick cloth, with a hole for the head to be seen, and a bed to lie down, and pillows. Method: The person walks to the bed without anything visible. He lies on the bed and he is covered with the bed sheet after keeping some pillows on his body, his head protruding from the hole. While music and drums play he takes out the hockey sticks from his pyjama in his hands. He slowly raises the hockey stick inside the bed sheet along with raising his head. Then slowly he squats with the hockey sticks rising up along with him, gets to his knees and then stands erect inside the bed sheet with the hockey sticks in his two hands and his head only seen through the hole. He has levitated to his full height. Then he reverses, sitting on his knees, then squatting and then lying down. The hockey sticks are hidden and the bed sheet is removed and he comes out and waves his hands. I take it you have never learned TM. letalone the TM-Sdhis, of which Yogic Flying is a part? It's fun to poke fun at things you don't understand, but you run the risk of making a fool of yourself when you do.